Our teacher is the Dharma Master Rev. Jomyo Tanaka. Ajari Tanaka, as he is called, is a traditionally trained Japanese Shingon Monk with an extraordinary life.Born in 1947, Ajari Tanaka began practicing Dharma and calligraphy at the age of 6 under the tutelage of his grandfather. 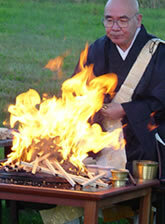 After graduation from high school, he entered the Kongo-Ji monastery in Tokyo where he began his training. He then spent a year in the beautiful Daikaku-ji monastery in the outskirts of Kyoto and received his certifications in Shingon, flower arranging, and calligraphy. Upon completion of his training at Daikakuji, Ajari spent five years in India wandering and studying Hindu philosophy. He returned to Japan for further training and in 1978, decided to visit the United States on his way to Paris. The United States would become his home for the next 21 years. Ajari Tanaka took a bus to Vancouver and then to NYC where he would live in a small apartment in Greenwich Village. 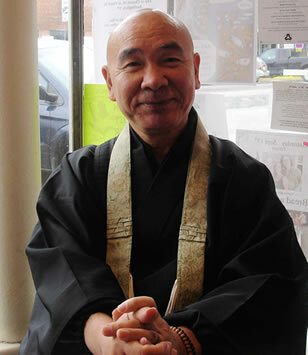 While in NYC, Ajari taught Shingon, calligraphy, and worked in a Japanese restaurant. In 1987, he was invited to visit Vermont and would soon relocate to a stunning 80 acre farm house nestled under the peaks of the Green Mountain National Forest. It was during his time here that Ajari would write many books and focus intensively on his own practices often spending entire days hiking through the mountains and chanting under waterfalls. During this time period, he also traveled extensively between Vermont, Europe, and Japan. In 1999, Ajari moved back to Tokyo and now spends the majority of his time in Japan where he is a professor at Waseda University though he visits the US once per year and makes several trips to China each year. He often emphasizes the importance of unity, respect, and inclusion among all religious traditions even commenting that a new mandala should include all religions. 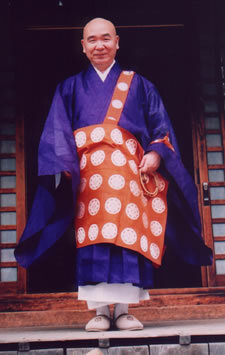 Ajari Tanaka is the essence of a spiritual master whose presence is strongly felt, whose humor is always disarming, and whose wisdom is extraordinarily profound in its simplicity.